King cakes are eaten throughout the world to celebrate the Epiphany, the day the Magi visited Jesus in the Christian tradition. A small figure of baby Jesus is often placed in inside or under the cake, and in Mexico, whoever receives the slice with the little lord is customarily obliged to host a dinner. Mexico City–based collective CAMINO, comprised of María José Baez and Daniela Michelle Ramirez, use this tradition to explore contemporary interpretations of religious customs in Amen, an exhibition with San Francisco artist Taravat Talepasand at Bass & Reiner Gallery. CAMINO created a large plaster cast of the figurine and sent it to artists, designers, and musicians from Mexico City and elsewhere, asking them to alter the object as they saw fit. Fifty of the creepy-chic sculptures are on view at Bass & Reiner, and though they are based on an identical figure, the result is a pleasing variety of work. Ana Bellido’s modifications are minor but transform the figure into a woodland hunstman, cloaked in rabbit fur and wearing a canine-shaped skullcap. The figure’s arms are crossed, as they are in all the pieces, but in this context the pose projects stoicism and dignity. Juanjosé Rivas intervenes more actively, reshaping Jesus into a tattooed minotaur with a fuzzy, doll-like head and pierced septum. The creature stands on a plastic pedestal with a red button. When the button is pressed, lights in the creature’s eyes flash and the voice of a cheap plastic toy recites the the Lord’s Prayer in Spanish. The ox sometimes symbolizes Saint Luke, which may be referenced here, but the pointed tail and Hellenic association suggest something more devilish. Some of the sculptures are humorous, like Taquito Jocoque’s piece, which is painted pink, affixed with googly eyes, and used as a vase for fake roses emanating from a hole in the head. Instagram user @anagdl (Ana Gómez de León ) also makes the statue a functional object by replacing its head entirely with a light bulb, with an electrical umbilical cord extends from the baby’s smooth white belly. Others use the figure as a canvas for abstract paintings or a tabula rasa for various characters. Talepasand, whose work engages with taboo and social norms in Iranian culture, offers a perfect companion to the CAMINO sculptures. 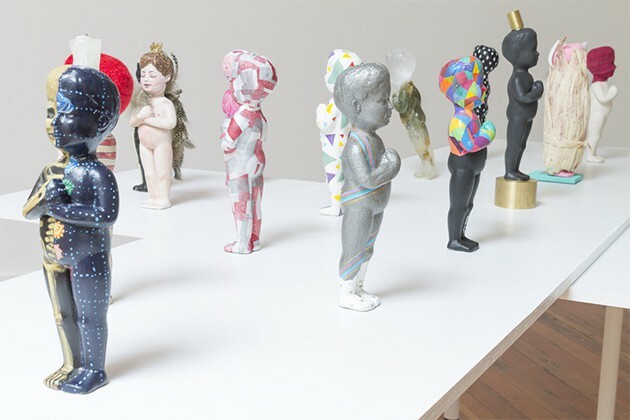 An altar in the corner of the gallery positions six porcelain statues from her Mullahs Ghost series (2012) around one of CAMINO’s Jesus casts. The women in the statues are draped in hijabs and chadors with only cartoonishly large breasts exposed and their prominent behinds outlined by form-fitting attire. Though the Muslim iconography is strong, the women resemble the Madonna encircling the Christ Child. The baby and the women are reduced to pan-cultural archetypes rather than specific individuals. This may explain why Amen is so wonderfully accessible. Though based on specific religious customs that aren’t practiced by all viewers, each piece represents a personal interpretation of these traditions, ranging from pious to sacrilegious, defiant to amusing.